The Congessional Budget Office's (CBO) latest budget projections released this week show how much worse recent legislation has made the fiscal outlook ($2.7 trillion of higher deficits through 2027), but it also shows how much more policy uncertainty these laws have brought. Because the laws contained so many significant policies that will expire at some point and are likely to be extended, CBO's default projections may not be a fully accurate picture of the status quo. 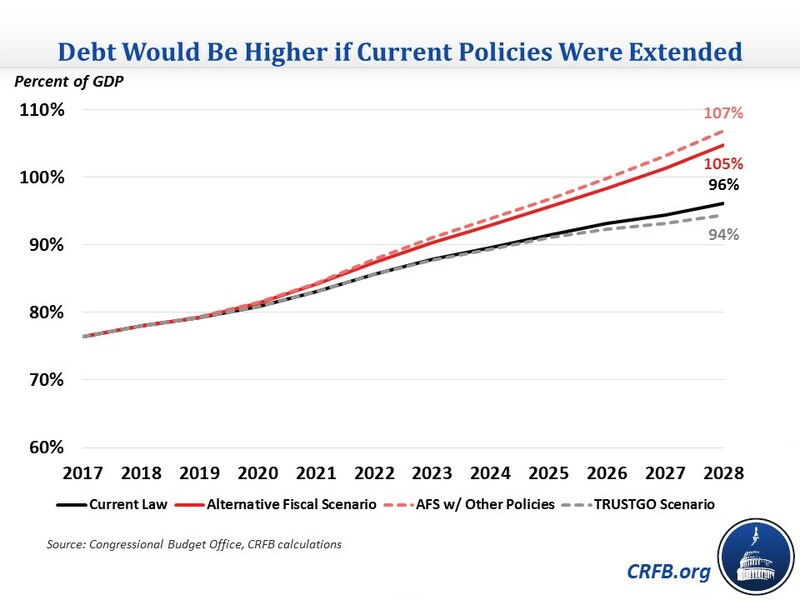 In this baseline, CBO revived its Alternative Fiscal Scenario (AFS), which assumes that several temporary policies are permanently extended and has debt reaching 105 percent of Gross Domestic Product (GDP) in 2028 instead of 96 percent under current law. However, even this scenario leaves out a few other extensions, which if included would result in debt equaling the all-time record of 107 percent of GDP by 2028. Extending the individual tax cuts from the Tax Cuts and Jobs Act (TCJA) that will expire after 2025. Increasing appropriations with inflation after 2018 rather than allowing those levels to drop precipitously after the budget deal expires in 2020. Repealing three health-related taxes that were delayed temporarily in the January continuing resolution. Extending full expensing for business investments after 2022. Extending other expiring tax provisions, most of which expired at the end of 2017. Drawing down emergency spending from over $100 billion per year to its 2012-2017 historical average of $11 billion per year. Source: Congressional Budget Office, CRFB calculations. Other policies beyond AFS are rounded to the nearest $5 billion since they are rough estimates. These alternative policy assumptions increase deficits by $2.6 trillion through 2028 above current law, making ten-year deficits $15 trillion instead of $12.4 trillion and resulting in the first ever $2 trillion deficit in 2028. As a result, debt would exceed the size of the economy by 2027 and reach 105 percent of GDP by 2028. The latter total would be the second-highest in U.S. history. Actual fiscal results could be better or worse for several reasons. They could be better if policymakers let some current policies expire or offset ones they do extend. They could also enact other deficit reduction, particularly by ensuring that trust funds that are projected to become insolvent over the next decade are kept whole. This "TRUSTGO Scenario," where lawmakers adhere to current law and make trust funds solvent, would result in debt of 94 percent of GDP in 2028 and would dramatically improve the fiscal situation over the long term. Tightening of interest expense deductions starting in 2022. Amortization of research and experimentation (R&E) expenses starting in 2022. Less generous parameters for three foreign tax provisions starting in 2026. The expiration of alcohol tax changes in 2020. The lack of fake changes in mandatory programs (CHIMPs) that allow for higher discretionary spending after 2018. The expiration of several health spending extenders over the next few years. 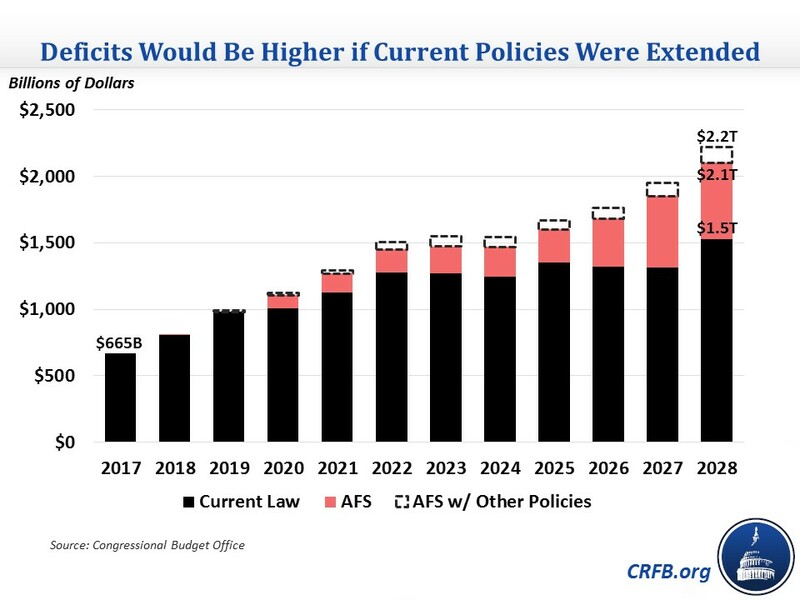 If these sunsets or backloaded offsets were done away with, it would increase deficits by over $600 billion through 2028 (mostly from the tax provisions), bringing the cost of current policy extensions to $3.2 trillion. About $120 billion of the deficit increase would occur in 2028 alone, bringing the total deficit to $2.2 trillion. With these higher deficits, debt would reach an all-time record of 107 percent of GDP. These numbers highlight the further danger of extending temporary policies. Lawmakers will need to reduce debt below where it is and is projected to be, but they should start by not adding to debt with these extensions.